Omega OPC in Williamsport, PA met for several years in the Pajama Factory, a business incubator that divided the former factory into many smaller spaces. The space had many limitations, including the fact that it was hard for visitors to find so the congregation began searching for a more permanent home. When they purchased their building, they wanted people to know that the former restaurant was now Omega’s new home. They bought a vinyl sign to put on the existing sign posts, but it lasted only a week and a half. That led the group to contact a sign maker to have a more permanent one made, but they were not able to afford the $5,000 price tag. A woodworker known to the group said he would like to make the sign, and Pastor Adcock purchased mahogany for the project. The woodworker ended up being too busy with his paid work to take on the sign project, but offered the use of his workshop – also in the Pajama Factory. Adcock wasn’t new to working with wood, so he decided to give it a try and started carving. After a while, the Pajama Factory said they needed the space he was using, and he moved the project to his house. “If we knew how much time and difficulty we would have,” Adcock said, “we probably would have just have bought a sign.” But he added that he enjoyed working on it. While he wasn’t new to carving, Adcock was more nervous about the paint and gold leaf portion of the project. He called a company that does gold leaf to get some advice, and tackled the rest of the project several months after he started. 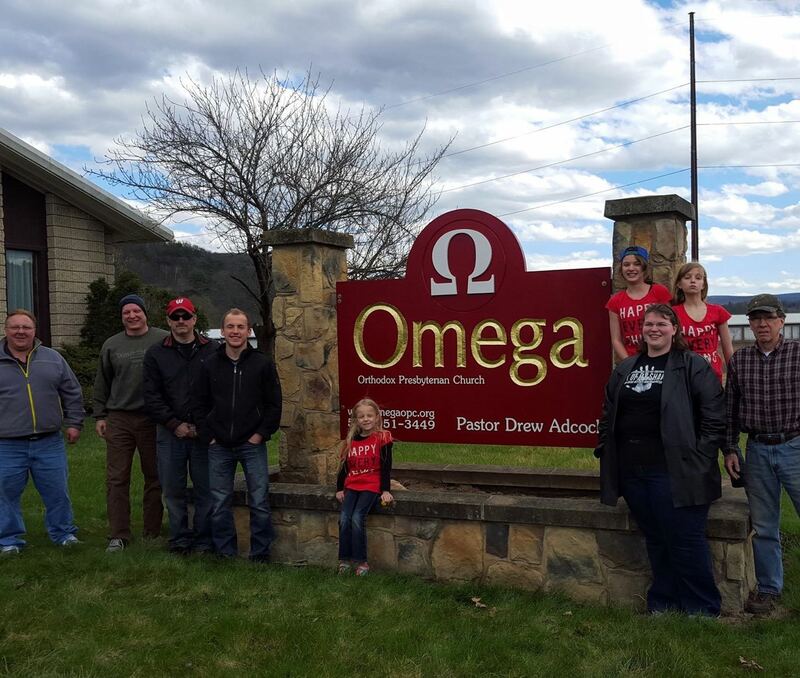 The church now has a good looking sign that will last for years, and those driving by know that Omega has a permanent home in Williamsport.